Mount Elgon is shared between Uganda and Kenya and stands at a height of about 4,000 metres above sea level (MoWE, 2013). In Uganda, Mount Elgon National Park covers nearly 1,121 km_ of the mountain’s 4,000 km_ area (UWA, 2009a). The mountain was listed as a UNESCO Biosphere Reserve in 2005 due to its considerable plant diversity, including several rare species of Afromontane flora, its cultural significance and role as a water catchment area (UWA, 2009a). Apart from being one of the most important areas of biodiversity and a water tower for both Uganda and Kenya, Mt. Elgon also serves as a catchment area for the drainage systems of three lakes - Victoria, Turkana and Kyoga (MoWE, 2013). Mount Elgon’s Afromontane forests provide a range of foods, fibres and fodder for the people living around the mountain area, including the Benet Ndorobo people (Ongugo et. al., 2014). 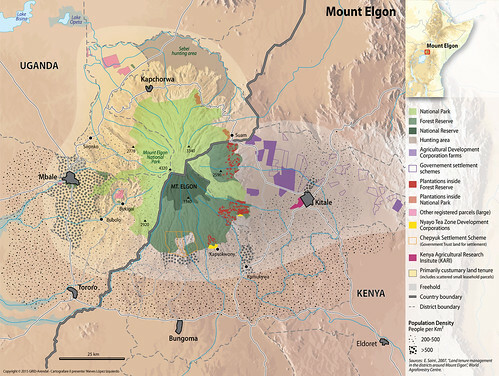 The mountain area contains endangered species, some of which are endemic to the Afromontane region, making it one of the major tourist attractions in East Africa (Ongugo et al., 2014).